The arrows represent hyperlinks. The blocks include links. Included in the persons index are all the persons mentioned in the source documents. Non family persons are linked to the sources where they occur, and family members to Personal histories, Families, and Ascendant and Descendant trees. 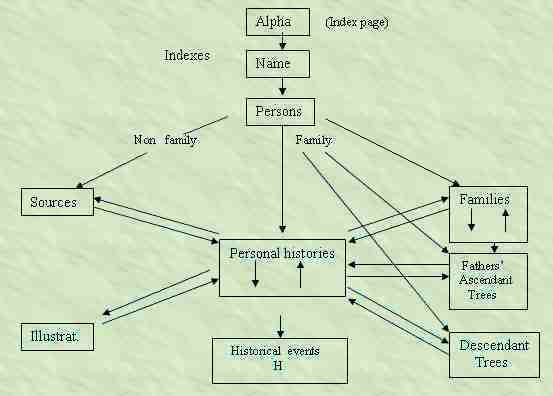 Links are person to person except for the links from Personal histories to Families which are person to father. The events in Personal histories are linked to their sources (where applicable), and there are reverse links from Sources to persons in Personal histories. The links in Personal histories and Families allow the trees within them to be ascended and descended.